Those who believe that religion is well-defined and easily recognizable will be shocked to hear that world systems of belief are not always what they seem. Our deities come in all shapes and widths, masks and costumes. There exists no one-size-fits-all-god that universally satiates the inner faiths of all people. So we have separate gods. Some gods are for the deeply down-to-earth who are entranced by sunsets, who tread barefooted through grainy sand, who go umbrella-less in the rain. Some gods are for those who prefer bare expressions and barer closets. Even intellectuals, whether actual or aspiring, who claim agnosticism have their gods—though most are unwilling to refer to them as such. For many, science is such a god. It holds awe-inspiring faith, religion, hope, and fear. It creates and destroys. It is respected and revered. Science is worshipped. People sit in labs for long hours on end, performing rituals with beakers, burners, petri dishes, and test tubes. Their efforts, they hope, will be returned with fruitful results. As Manna from heaven, statistical significance is divine. When nature runs its course, disrupting human activities, scientists everywhere turn to their god. Humbled by the “force” of nature, they ask questions and seek answers. And answers they find, through reading, research, results, and replication. In any religion, practitioners engage in processes of conversion. They become part of the group when they have performed these rites. Their membership is celebrated. In the face of wrongdoing, science and its practitioners ask for forgiveness. When a drug, over time, is found to do more harm than good, the religious community beseeches citizens to forgive the error. The research was once wayward, but now it has found its correct path and beckons citizens to follow it once again—keep the faith after all! There is danger in not acknowledging that science is a religion. People are circumspect when religious enterprises become too wealthy. Conspicuous mega churches, like pastors with luxury cars, are readily noticed and critiqued for their financial excess. But hospitals with multi-million dollar renovations, like medical doctors with multiple McMansions, unlike those in the business of “true religion,” are not evaluated with the same scrutiny. When science is an invisible god, we do not ask its peddlers about their riches. We allow millions and billions of currency in wealth extraction in the name of science. Our governments, with taxpayers’ moneys, support science. We become literally indebted to science each time we dig in our pockets for coins to purchase prescription drugs. We pay tithes to religious institutions in exchange for protection and service in much the same way we pay for science to preserve our health and well-being. For some reason, though, some do not label the preservation of health and well-being that traditional medicines provide in the same magnificent reverence, but call it some magical religion of mixing potions. The work of a pharmacist, who studies the contemporary version of potion-mixing, is however professional and scholarly. The contradictions in terms that aim to insulate modern science from its obvious connections to past customs are widespread and far-reaching. Modern science and the traditions of Imhotep that preceded it have some linkages, but the differences far outweigh the similarities. Most pressing is the difference in aims and means. Traditional medicine actually aimed to cure people through the means of observation and learning—the Imhotepic Oath. Practitioners of traditional medicine, for instance, would observe animals and plants to understand how the natural world could be used for good, though without disrupting the perfect world order of things. On the other hand, practitioners of modern medicine aim not to cure but to control populations and enrich themselves. Modern medicine is less concerned with curing people, but only to keep people in need of cures. The money is not in the cure, because if people are well, then they no longer need to pay for treatment. So the aim of modern medicine is to arrange increasingly costlier hospital visits, to keep people going to hospitals, to administer vaccines that need multiple rounds of injections each year for decades, to prescribe drugs that people consume for lifetimes—that is the only way that modern medicine can achieve its aim of maximum monetary gain, of wealth extraction from the majority to the few. The beneficiaries of a religion are rarely the ones who stand sweltering on sidewalks to pass out brochures to passersby. Those who preach of science’s lofty rewards are unwittingly peddling a religion that exploits more than it saves. And it does save. There is no denying that a successful heart transplant extends the life of a ninety-year-old politician through the next election. However, we rarely pose the question: what is the true cost of a single successful surgery? Placed under its own microscope, the means of modern science are cruel and unusual to the detriment of nature and to human existence. One only needs to consider the sheer number of bodies that are ripped apart, experimented upon, and discarded to justify a mere “scientific discovery.” One only needs to consider the number of human and animal rights violations that occur to secure blood, organs, and appendages to be harvested and kept in banks. One only needs to consider the vast biochemical, nuclear, and radioactive wastes that science produces and their harm to planetary sustainability. All this violence is masked when science is imagined as an objective activity in search of truth and not a god with its own religious followers. The destruction and brutality that is found in science cannot be justified with the claim that it happens in the name of humanity and morality. It is only justified, illogically, in the way that devotion to a violent god, no matter the outcome, can be irrational if connected to tribal affiliations and religious exceptionalism. 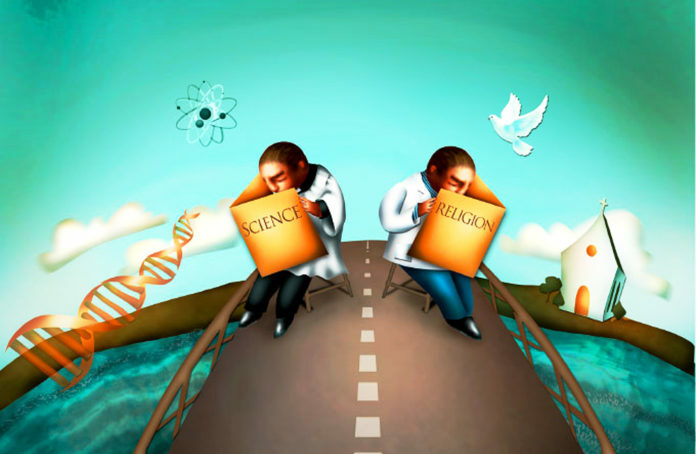 In this way, science draws its similarities with religions that blindly drive practitioners to commit unspeakable acts that would otherwise be condemned or sanctioned. Science as god and religion should be made explicit in order to subject the discipline to real scrutiny and to admit its shortcomings. We first have to acknowledge modern science, a clandestine departure from the Imhotepic tradition, as the religion that it is before we can genuinely understand and improve its endeavors and bring it back in tune with nature and humanity. Perfect prose! Near perfect reasoning – only that there’s no such thing as perfect logic. But this argument, this rendering of the religion that is science, in exquisite language is a beauty to be behold, like a real man is made incapable of looking elsewhere after seeing a gorgeous lady. How one can debate it remains to be seen. Nefetiti is something! The mere parallels she draws between religion and science, particularly of the human and animal sacrifice needed to appease the gods and to improve the human condition is a breathtaking revelation which needs our further attention. The sheer heft of Nefetiti’s arguments in this essay leaves any scholar stripped to the bone, of the belief in science. Nefetiti can write man, she can write! Well done. Clearly, the last three paragraphs by Nefetiti were an indictment! Science itself, and our perceptions of it, cannot remain the same after this essay! While one can relate to a lot of human endeavours in a religious fashion, that is, be over-zealous and too trusting of it, science will always differ from blind faith in a lot of ways. Material benefits of science are here with us, and not promised to come in the hereafter. Mistakes in science get acknowledged and improvements are sought. Generally, scientists abandon false ideas when they have been demonstrated to be outdated. Religion sticks to its myths, some of which are unprovable. Johnson Tunu, you’ve never seen an Atom but you believe there’s such a thing. Or do you not? How’s this any different in form, if not entirely in context, to the man who believes in a God but has yet to meet Him? Well, Dade, the scientist will insist that at least he can feel the presence of an Atom, at will. Perhaps, even turn his particulate theory of matter into an Atomic Bomb making process, which is real, in such a way that makes the unbeliever buckle at the seams of his unbelief. How do you counter that? Well, Narmer, there’s quite a straightforward rebuttal. First, the assumption that the same laws govern the behaviour of an Atom and God, even if in theory alone, cannot be verified. One cannot say because I can make you feel the “presence of an Atom” then you should make me feel “the presence of God,” for instance. Second, the idea that the theory of the particulate nature of matter is the “source” of the power of the Atomic Bomb is either insidious or rather ignorant. Even before the current Atomic Theory was widely accepted as “fact,” engineers and goldsmiths were also equally able to fashion great tools from “backward” theories! Even gunpowder was discovered by alchemists. Even fire, was still employed in the smelting of steel, which is used in building actual bridges over actual rivers, based on a theory that today can be considered idiotic at best. I am speaking of the Phlogisten Theory here. More, people who do not work with the same paradigms of thought, that is people who do not believe in Atoms, or the particulate theory of matter, have equally been able to make monumental discoveries. Here, I am speaking of the Hayans and Hayan Steel-making, which you wrote about in a recent essay. I reject the idea that it is only through the scientific profession that actual stuff is discovered. Food and the process for making it, the confluence of growing a seed in the soil, watering it appropriately and allowing it Sunlight, wasn’t discovered through science! Penicillin wasn’t discovered through the scientific method, and neither was iron or steel although students in this day and age are indoctrinated as such – with silly chemical equations of iron-making. Certainly neither was fire or the constitutions of the stars only discoverable through the scientific method. In fact, the argument remains that the over indulgence in the belief in science as the only “it” and the only “almighty” practice of wisdom has forced many other useful paradigms of thought out of practice. It’s like when Christians force out Vodun, and every practitioner of Vodun, from a village and then proceed to insist that God is only discoverable through Jesus the Christ! Modern science has forced out and continues to force out many fine practices of wisdom and discovery with its modern insistence on “truth,” making students of its myths tirelessly tooting its theories, like the Atom, as if they have actually seen it themselves. It is the same way Christians and Muslims insist on the primacy and exceptionalism of their religions as if they are the only ones whose prophets have seen God! Monopolies everywhere are detrimental and discriminatory, and so is the monopoly on the “truth.” Modern science has managed to carve its place in all of history, front and backwards, as the only “truth” seeking paradigm to the exclusion of all others. This is propaganda executed exceptionally well. But how can students who can barely actually understand what a random distribution of a discrete variable is, although they blow the horns of the power of the variable, actually be expected to understand the larger paradigms within which their small grasp [of the myths] of science are actually carefully couched? How can a student of science today be made to appreciate anything else? Never! You see? Such is the Modern Science of today, or the Naziscience of today, or the Viertes Reich Scientific Order, or the Holy Trinity of The Supremacist Sciences. We live in a time of total obeisance to modern science, departing completely from the Imhotepic Traditions. Narmer, pardon the rather lengthy treatment of the rebuttal. I can watch atoms, and even subatomic particles, and their interactions in an electronic microscope or at CERN, the nuclear particles research centre underground in Switzerland, or elsewhere. We can all see and feel the effects of the reality of the existence of these particles, just like I’ve never seen the first and only Queen of Ghana, Elizabeth II, but through different recorded images I know I was unfortunately her subject the first four years of my life. Those who claim the existence of an entity which cannot reveal its reality at least indirectly have a huge task convincing doubting Thomases about their dogmas. Some individual scientists may behave as if they had a monopoly on the truth, but science itself never does that. Prof Stephen Hawking cannot force anybody to buy some of his fanciful ideas about artificial intelligence, or that we shouldn’t try to contact extra-terrestrials. There are no sacred cows in science. People are constantly thinking even of ways to possibly overcome the Einsteinian speed limit in the known universe. Johnson Tunu, no one has seen an Atom! Even at CERN, experiments are conducted, which are interpreted and the structure of the theoretical Atom deduced from those results. There’s no such thing as an Atom, only the theory. If you like you can show me this so-called CERN image of the atom. I promise then that I shall believe you completely. Also, isn’t this the issue, almost every student of science believes they have seen the picture of an Atom somewhere. Well, show me. Very interesting they way science has been taught. Does science and the practice of it constitute religion and those who practice it believers?! I don’t think so. The tenets of conventional religion dictate that the deity and the principle doctrine can neither be contested nor questioned. A believer has only to believe and seek not understanding. Science, on the other hand, which is basically a set of theorems and hypotheses, once tested and proven to be repetitive become laws, is universal and is guided by universal principles. Science thrives and has proven to be an indispensable tool towards technological advancement in a plethora of fields known to mankind. For example, we wouldn’t be typing away on glass if the principles of physics, which a layperson couldn’t understand just because they couldn’t perceive them humanly were not experimented on to the umpteenth time, learning, adjusting the variables and improving every successive time until the near perfect product was realised. Science made it possible to have more people revived in the ICU and HDU where their ancestors would have long been buried just because the caregiver could not feel a pulse. While WIFI and atoms cannot be seen or felt by our senses, we can all tell of their presence and absence. So, like a friend said here, if you are doubtful of the existence of the atom, then how can you convince everyone else you exist? In the respects that you have re-iterated, you are not incorrect. Although one must needs acknowledge that modern science alone cannot be given credit for industrial achievement even in the twenty-first century. But allow a brief reaction to what you said about religion: That “a believer has only to believe and seek not understanding.” This is incorrect. Many believers seek the understanding of the ways and nature of their Gods (or of Nature itself, of Mother Earth, of the River, and of the Forests and the plant and animal life in it). Herbal Medicine, or Traditional African Herbal Medicine, is still not around today because it doesn’t work. Well, because significant parts have been proven to be sustainable procedures (allow the medical term here!). Iron and Steel, which have been the backbone of industrialization weren’t even discovered through any scientific theory. Humans do things, and often where there’s writing, they improve on things. Advancement cannot be the sole forte of science but of the human spirit. By all rights Science has never claimed to prove or disprove the existence of god or the supernatural there are many scientists who believe that science and religion go hand an hand i will say this though science is just the study of nature and the universe and how it works by all rights no one man or people invented science though i will say many of the things our African ancestors were doing was just that science. They may not have called it that but often times we look at everything including the universe these days from a western mindset often times western science has a habit of dismissing what they can’t see with the naked eye or rely too much on material and there computers or technology instead of simply using their mind our ancestors were not limited by such ideas they were very open minded and conscious of what was going on around them to put it bluntly they didn’t need to use computers too understand the world around them they utilized their intuition or instinct used their senses to make sense of the world around them. End of the day I love science and find all branches of science to be interesting.